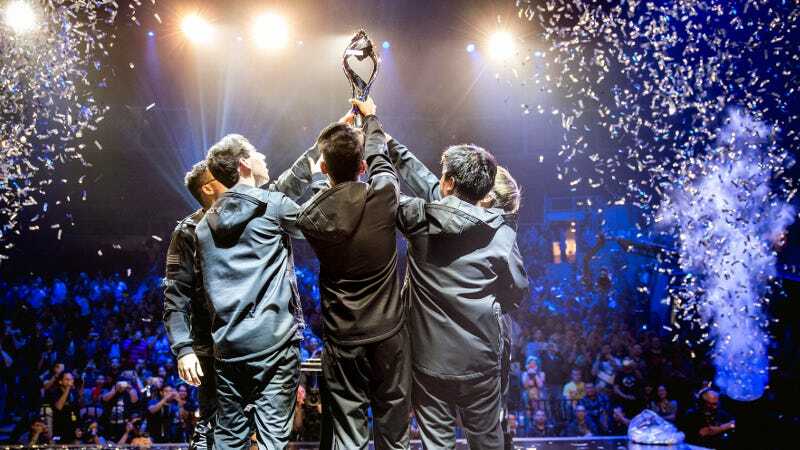 History repeated itself at the end of Team SoloMid’s and Counter Logic Gaming’s five-game North American LCS final on Sunday, as some clutch play from a CLG carry shut down TSM’s title challenge. It’s going way too far to say that Trevor “Stixxay” Hayes won the series for CLG, but he delivered at two absolutely key moments to halt the momentum of a TSM squad that often looked a little sharper than CLG. Game 3 and Game 5 were both going wrong for CLG and TSM’s generally superior team fighting was undoing a lot of CLG’s strong early play when Stixxay made his presence felt. His biggest play probably came at the end of Game 3, which was completely spiraling out of control for CLG when Stixxay turned the tide. His Game 5 heroics weren’t quite as dramatic, but he still put the dagger into TSM’s title hopes as his Tristana ground TSM into dust in the final fight of the series. For my money, this was the most fun series of the weekend, and Game 3 was probably my favorite game of LCS League of Legends so far this year. CLG and TSM’s combination of strengths and weaknesses made for a wild and unpredictable final on Sunday. I also left feeling like both these teams need to grow a lot if they’re going to stay ahead of the rest of the North American division. North America has a spring champion, but I’m still not sure we know who really is its strongest team.